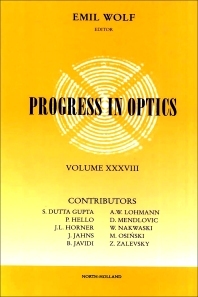 This volume contains six review articles on a range of topics of research in optics. The first article deals with various nonlinear optical phenomena in stratified media, showing that resonances which arise from stratification are of considerable importance for achieving low-threshold nonlinear optical devices. It also includes a study of optical bistability and harmonic generation in Kerr nonlinear layered media, and various phase matching techniques are discussed, along with developments in gap solutions, weak photon localization and enhancement of nonlinear susceptibilities in layered composites. The second article reviews the optical aspects of interferometric gravitational-wave detectors, and article number three presents a review of temperature-related effects and thermal modelling of vertical-cavity surface-emitting lasers (VCSELs). The review concludes with a look at the most important results obtained. The fourth articles describeds some theoretical developments in mathematical techniques that are used in physical optics and in optical information processing. These include generaliztions with parameters which take on fractional or complex values, and their use in areas of optics is discussed. Following articles discuss a number of Fourier-plane nonlinear filtering techniques and present an overview of the field of optical digital computing and interconnection. Various aspects are covered, including the historical development, the motivation for the use of free-space optics in computing applications, computational aspects of nonlinear optical devices and optical interconnections and their implementations. The articles conclude with an overview of architectures and systems for free-space optical computing and switching.